I was not expecting much from this movie. It’s a January action movie and Arnold Schwarzenegger’s first starring role since 2003’sTerminator 3: Rise of the Machines. All things considered there weren’t a lot of terribly compelling reasons to think this one would be good. I was pleasantly surprised, however, that the movie was actually quite a bit of fun. The Last Stand takes place primarily in Sommerton Junction, a small border town where most of the town has left for…some kind of event (I honestly can’t remember, but the details here aren’t really important). With most of the town gone for the weekend Sheriff Ray Owens (Schwarzenegger) is expecting a slow and uneventful couple of days. Of course, however, this is not going to be the case, because this is an action movie, and gosh darnet people paid to see some action. Meanwhile, in Las Vegas, notorious cartel leader Gabriel Cortez manages to escape from federal custody, takes an FBI agent hostage, and hops in a high-powered sports car to make a run for the border at 200 miles per hour. His destination? Why Sommerton Junction, of course, where a group of cartel goons are constructing a bridge to span the canyon that creates a natural border between Sommerton and Mexico. The Last Stand is big, dumb, and schlocky, but that’s the reason it’s entertaining. This is the kind of movie that winks at you and says, “Yes, this is going to be silly, but if you come along for the ride we’re going to have some fun.” Arnold is essentially famous for being a terrible actor, and here he brings all the charisma and awful line delivery he’s known for. The rest of the cast does a reasonably good job; no one’s turning in star performances, but they each bring a human quality to their characters. In a way, even though the performances technically aren’t as good as those in last week’s Gangster Squad, the characters feel more like people rather than cartoons. Even Johnny Knoxville is surprisingly not annoying, the film knows when to use him to get some laughs, but never lingers long enough for us to get sick of him. The action in the film is actually very well directed and relies primarily on practical effects work rather than overusing CGI. There’s a coherent flow to all of the action sequences, and you never lose track of the characters during those scenes. That may sound like a small victory, but when so many of the biggest action films can’t even accomplish these simple things it’s sort of incredible that a schlocky January action throwback manages to best its summer blockbuster contemporaries. The movie takes a little bit to settle into its groove, and, by necessity of the story, most of the early action takes place away from Sommerton and Arnie, but once the paths start to converge things take a really fun turn. There’s some great action set-pieces, some fun laughs, and a really excellent no-frills fist fight. 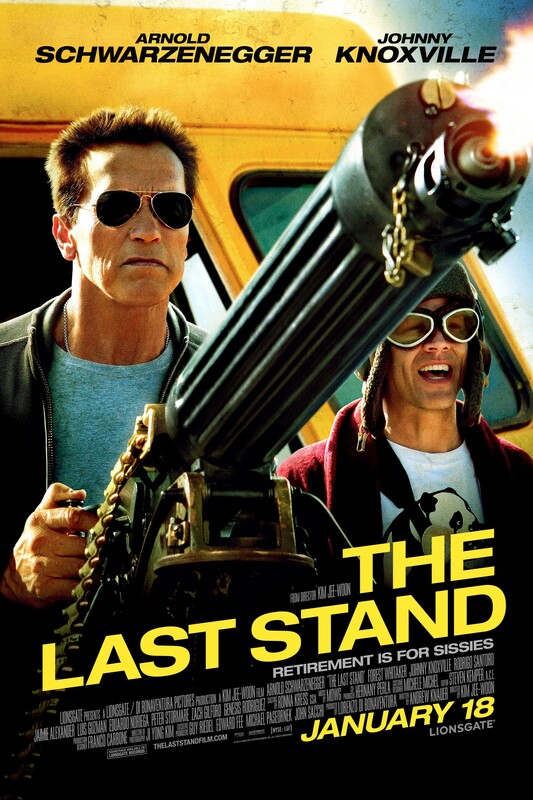 The Last Stand knows what it is and doesn’t try to be anything more. It’s big, dumb, action schlock, but some fun performances and some legitimately good direction from South Korean import Kim Ji-woon elevates this to something that is much more entertaining than it probably should have been. It’s not a great movie, but it’s worth a look if you enjoy action films.